Editor’s note: February is Cancer Prevention Month. 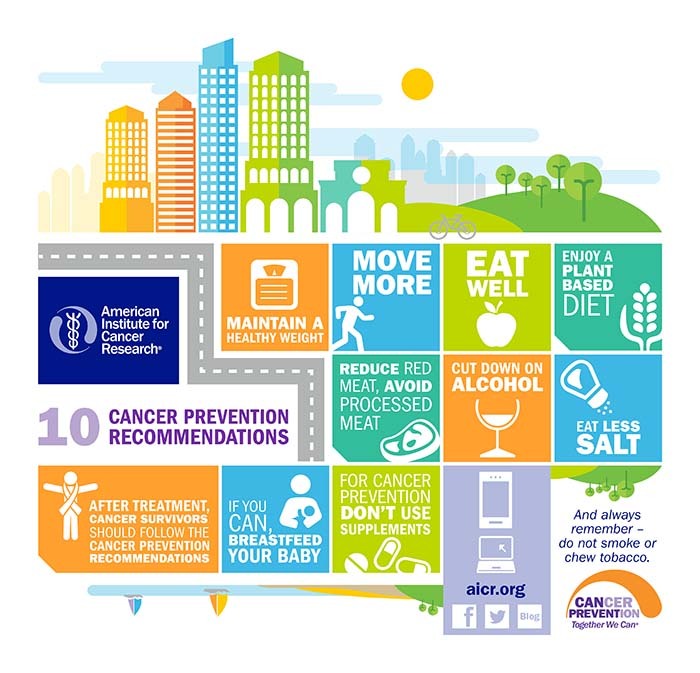 Throughout this past month, the American Association for Cancer Research (AACR) has been pleased to support the American Institute for Cancer Research (AICR) Cancer Prevention: Together We Can campaign, an initiative dedicated to promoting evidence-based information to reduce cancer risk. This blog post was developed and shared by the AICR. AICR research focuses on how diet, nutrition, physical activity, and weight affect cancer risk and survival. In the United States, about one in three of the most common cancers could be prevented if everyone were at a healthy weight, maintained physical activity, and ate a healthy diet. A recent study in the United Kingdom found that people who followed five aspects of a healthy lifestyle were significantly less likely to be diagnosed with cancer than those who did not. Overall risk of cancer was reduced by about one-third in people who were non-smokers, had a healthy weight, were physically active, ate a healthy diet, and limited alcohol within the national guidelines. For this study, data were collected from over 340,000 participants in the UK Biobank, a prospective study of about half a million people. In a follow-up after five years (median), 14,285 participants who were diagnosed with cancer were quizzed on their lifestyle habits. Participants who met all five of the healthy living factors were 32 percent less likely to be diagnosed with cancer than those who satisfied only one or none. The addition of each healthy behavior was associated with an 8 percent reduction in cancer risk. “Even small changes in lifestyle can change your cancer risk, and adopting healthy behaviors will reduce your risk of other common chronic diseases, too,” says Nigel Brockton, PhD, director of research at the American Institute for Cancer Research. The researchers report a 25 percent reduction in colorectal cancer and a 35 percent reduction in breast cancer, which are in line with other published data. AICR/WCRF CUP reports show that lifestyle plays a central role in reducing risk for both of these cancers. Weight, physical activity, alcohol, and diet all link to colorectal cancer risk, and alcohol, weight, and physical activity link to postmenopausal breast cancer. Along with large reductions in cancer risk and cancer mortality, the researchers also found reductions in diabetes, vascular disease, and dementia, thereby showing large health benefits from healthy behaviors. The study’s authors said the strengths of this study are the size of the cohort and the prospective collection of data. The main limitations, they noted, are the low response rate to the UK Biobank, and the relatively broad dichotomization of behaviors into “healthy” and “not healthy.” Researchers did not look at diet beyond fruit and vegetable intake, and the analysis of smoking did not take into account former smokers. However, these results are consistent with other large population studies that have used more sophisticated data collection. The results are also consistent with AICR/WCRF recommendations and conclusions from AICR/WCRF Continuous Update Project reports. If making wholesale changes to your lifestyle is overwhelming, the authors suggest that taking up one additional healthy behavior may be a more acceptable message. The authors also emphasize that clinicians should “make every contact count” to reinforce the importance of adopting health behaviors to reduce chronic disease risk.